Occasionally, when hearing or reading about diamond cuts, you will also hear the words “old” or “modern” attached. 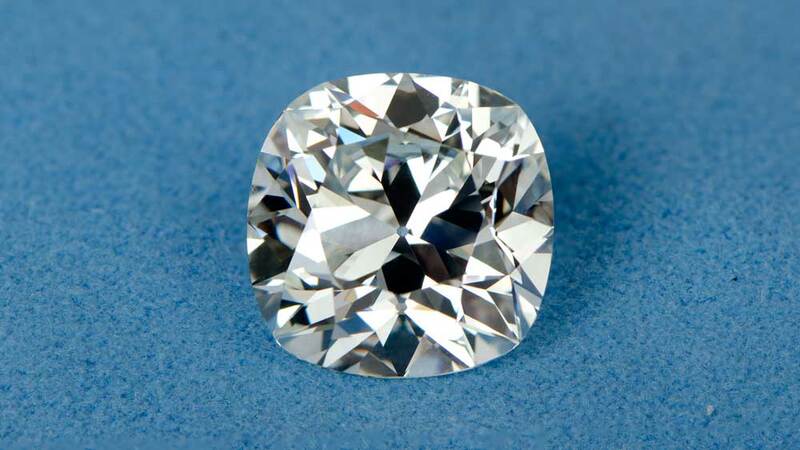 One example is the modern round brilliant cut that accounts for the majority of diamonds sold today. The opposite end of the timeline gives us the old mine cut and old European cut. 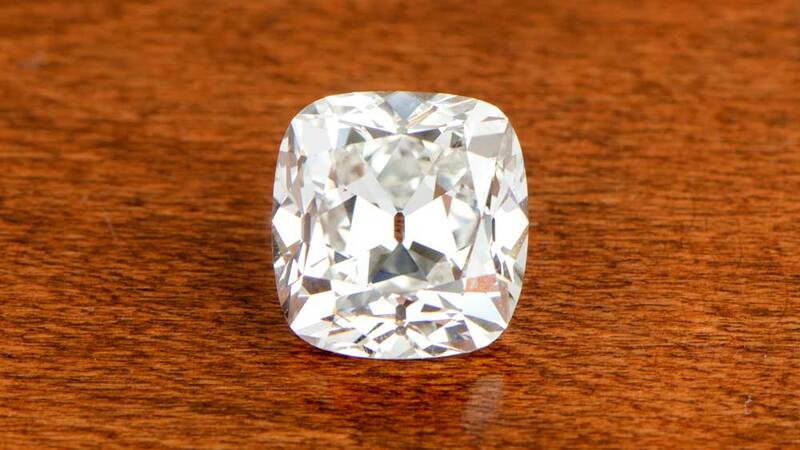 The old European cut is a little easier to describe and to relay the history of, as it is the forerunner of the aforementioned modern round brilliant cut diamond. The old mine cut, though, requires – and even deserves – a much closer inspection of its history and heritage. How Old is the Old Mine Cut? As with almost everything, “old” and “new” is relative. If we class the Great Pyramid of Giza as “old”, then even the castles of medieval England can be classed as “modern” despite some being nearly 1000 years old. With diamonds the descriptions don’t cover quite such a period but, with old mine cuts, we are talking about diamonds being cut up to 300 years ago. The old mine cut is probably the oldest recognized cut type we know today. It was very popular in the early 18th century and had been around for some time before. The old mine cut had something of a renaissance in Victorian time and is still in demand today. The level of demand is enhanced by there being relatively few good examples around. The name is, in itself, potentially misleading. Before Africa became the diamond center we know today, most diamonds came from India or Brazil. Once it was realized that Africa did indeed have colossal diamond deposits, it quickly eclipsed the rest of the world in terms of volumes produced. Because of that, diamonds which preceded the new era were said to be from the old mines (old miners cut). The term is more broadly applied now, with the country of origin not being so important as age, cut and cutting method. All diamonds which have come to market for the first time in the past 20 years are likely to have been laser cut. At the very least they will have been precision-machine cut. The beauty, literally and figuratively, of old mine cut diamonds is that they were all hand cut. Anything that is hand produced, as opposed to mass-produced, has one fantastic benefit. Every single one of them will be unique, regardless of how good or how consistent the maker was. The same is true of the old European cut. It would be a fair assumption that most old mine cut diamonds have been lost to time. Loss, theft, damage and more does take its toll, but that’s not the whole truth. Unfortunately, all too many old diamonds vanish because of our obsession with modernization. Because of the slightly “rustic” appearance of old mine cut diamonds, and the modern penchant for round cuts, a lot have been re-cut in the intervening decades. The aim was to make them more appealing to a marketplace which demanded ever “cleaner” diamonds. Thankfully, in the past decade or so, this trend has reversed, with old mine cut diamonds becoming ever more popular, and very saleable in their original state. As we gratefully start to move out of the bling era, the age of subtlety and understatement is beginning to take shape. Old mine cut diamonds are more desirable than ever, and their unique light reflecting properties treasured. When we talk about old mine cuts, it’s usually thought of as the classic old mine almost-square shape. Producing round diamonds by hand is incredibly difficult, even for the best cutters, and so a more cushion-type appearance was used. The basic finished cut is similar to modern diamonds only in that it incorporates the same elements. From top to bottom, as with other cuts, there is a table, crown, girdle, pavilion, and culet. Again like modern cuts, there are 58 facets on an old mine cut diamond. The differences, once we accept the underlying physical similarity, are quite pronounced. An old mine cut will have very different proportions to more modern cuts. There will be a smaller table with a higher crown and a larger culet. The girdle can often be inconsistent, and very thin in places. 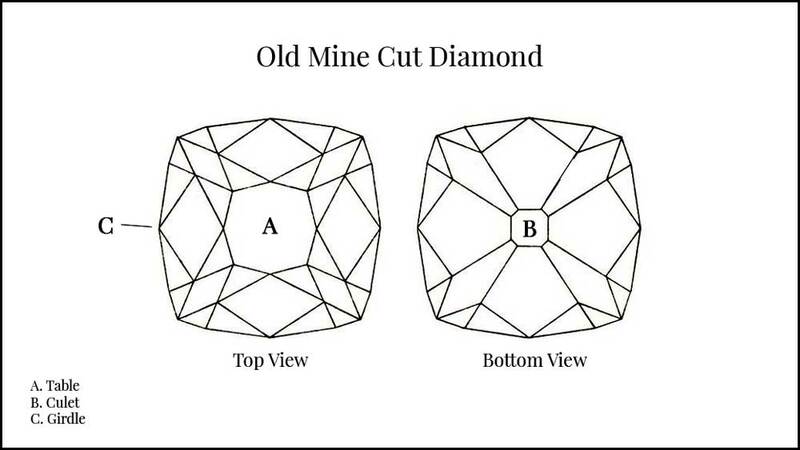 Although we do tend to think of old mine cut diamonds as square-ish, there are several other cuts which qualify. 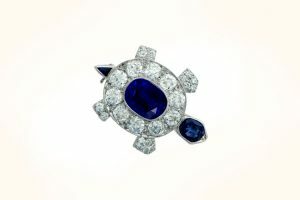 Genuine antique cushion, emerald, Asscher and marquise cuts all come under the banner of old mine cuts. By grinding two diamonds together, and then polishing each stone individually, each old mine cut diamond was left with its own personality. The proportions were designed to make the most of the available light at the time which was, of course, candlelight. The warmth of the candles was enhanced much more than it is in modern stones, in the same way that old mine cuts don’t usually have the “sparkle” of, say, a modern round brilliant diamond. It might seem odd to describe any diamond as eco-friendly, but old mine cuts are just that. They are recycled and re-used with no subsequent demands on the environment. In fact, it could even be argued that there are enough diamonds already available in the world to keep us going indefinitely. Fashions come and go, that’s no surprise. At the moment, the demand for vintage and antique styles is enormous, and nothing says antique better than an old mine cut diamond beautifully set into an engagement ring. We can all but guarantee you’ll never get two old-mine cut diamonds that are the same. The very nature of how they are produced makes that impossible. Individuality, uniqueness, call it what you like, the result is the same. Well very different, actually, but you get the point. Today, jewelry is made as much for a quick turnover and maximized profits as anything else. Back in the days of the old mine cuts, the aesthetic appeal was everything. Nobody was grading diamonds with the precision of today, so looks and light properties were just about everything. This meant beautiful stones with amazing effects on the available light. In the last 60 or 70 years, civil war and internal conflicts of all types have been an everyday occurrence, and this means that diamonds have frequently been used to finance one or both sides in the fight. These blood diamonds are usually mined by workers in appalling conditions and smuggled to unscrupulous dealers to be sold for profits used to buy guns and bullets. Old mine cut diamonds precede such terrible times, and so are amongst the most ethically sourced diamonds in existence. If you’re still not convinced about old mine cut diamonds, go and see a jeweler who has some in stock. Lay them down and compare them to modern, laser manufactured stones, and you’ll see the difference. The old mine cut may be a little more “rugged” than the modern stone, but it will be all the more beautiful for it. Click here to explore our collection of Old Mine Cut Diamond Engagement Rings.